We are pleased to announce the first solo exhibition of the New York based artist Sarah Oppenheimer at DUVE Berlin. Oppenheimer’s work evolves from an engagement with space through sensory perception and social interaction. Visual perception and bodily movement are central to her practice; through her architectural interventions a cinematic experience of space is created. At Duve Berlin, Oppenheimer further develops her investigation into lines of sight in a mode of seeing she calls “self conscious voyeurism“. 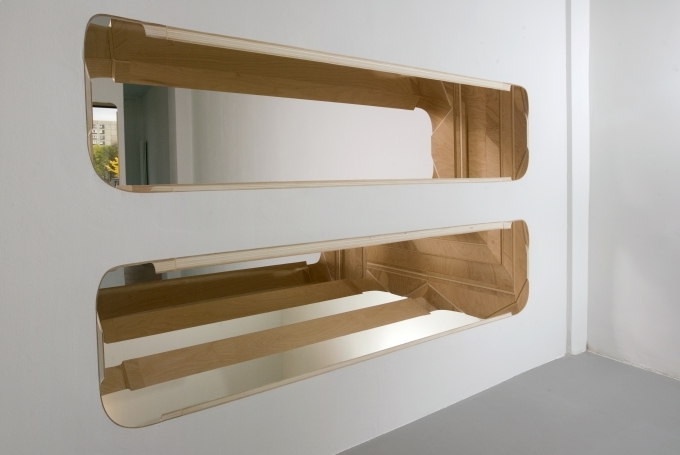 *P21 x P41* is a mirror enhanced geometric aperture inserted into the walls of the gallery. This architectural periscope reflects and multiplies sight lines. It exposes scenes not usually visible to gallery visitors. 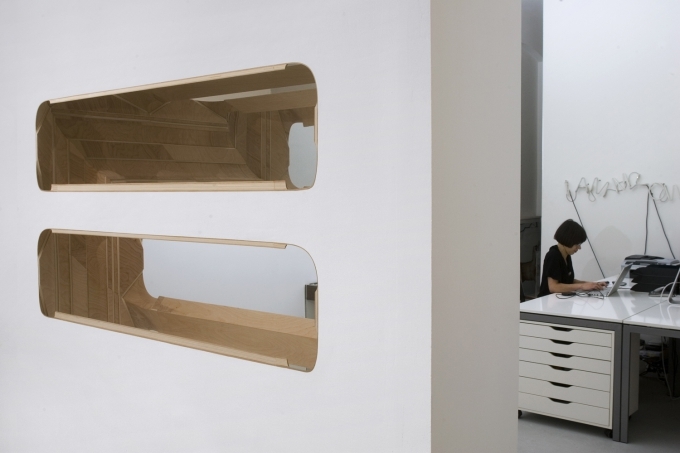 The viewer can peer into the private office area and beneath the desks of gallery staff. Unlike the cinematic gaze, the relationship between the viewer and the observed is reversible: the observed can look back at the viewer. Oppenheimer’s aesthetics are rigorously structured upon the laws of optics and architecture. 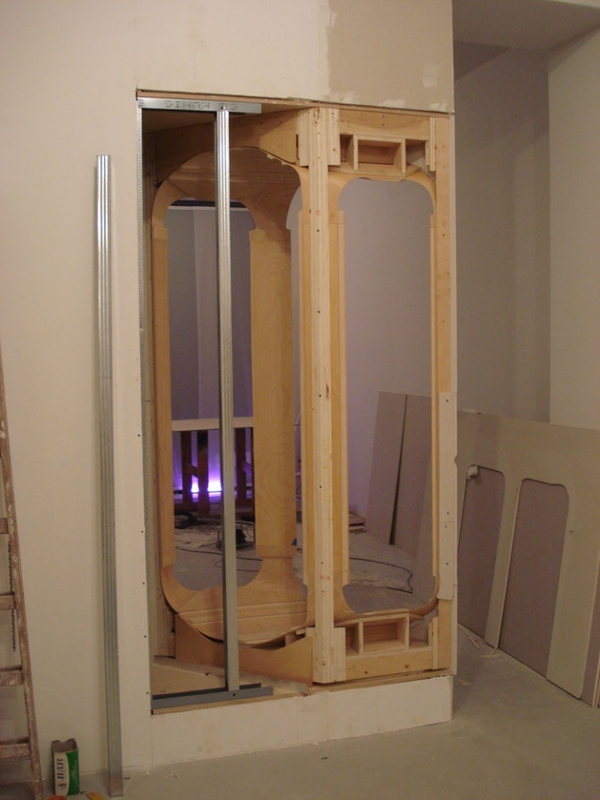 Oppenheimer collaborates with engineers and technicians using rapid prototyping and customized materials to produce the structural skin of her wall-enclosed apertures. This method of working is catalogued according to a typological system that classifies the perceptual and material form of holes. This system generates a numeric title for each sequential work. Sarah Oppenheimer is an artist based in New York. Recent and upcoming solo exhibitions include St. Louis Art Museum (St. Louis, MO), P.P.O.W. (New York, NY) and Annely Juda Fine Art (London, UK). Group exhibitions include “Automatic Cities“ at the Museum of Contemporary Art San Diego (San Diego, CA) and “Inner and Outer Space“ at The Mattress Factory (Pittsburgh, PA). Sarah Oppenheimer has recently been featured in ARTFORUM.com, Sculpture Magazine, Art in America, and Art Forum. In the past year she received awards from the American Academy of Arts and Letters and the John Simon Guggenheim Memorial Foundation fellowship, among others. She is currently teaching at Yale University, where she received her MFA in 1999.